Which she partook of with her beloved Agape. Intoxicated by your blood Irene. The Holy Martyrs Agape, Irene, and Chionia were sisters who lived during the reign of Emperor Diocletian (284-305). They hailed from Thessaloniki and were left orphaned at an early age. When a persecution against the Christians broke out, they left their homeland and went to a mountain near a lake in the area of Nicaea, where they lived in a hermitage with a priest named Zoilos (Dec. 22). Upon the martyrdom of the blessed Chrysogonos (Dec. 22), the teacher of Saint Anastasia the Pharmakolitria (Dec. 22), near the lake where Zoilos and the three sisters lived, divine revelation led the holy priest and ascetic Zoilos to collect his honorable relics, including his head which was cut off. 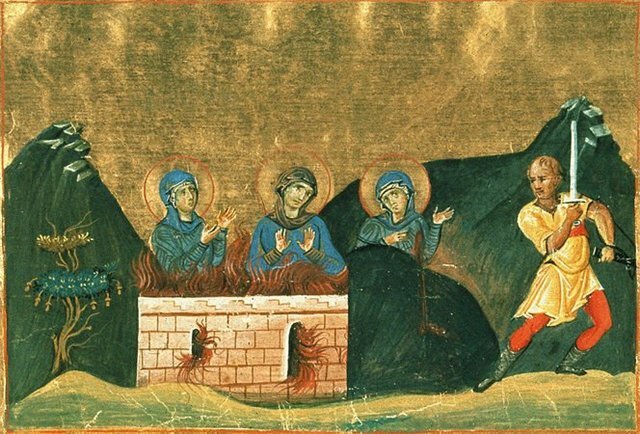 Thirty days later Saint Chrysogonos appeared to him and informed him that the three sisters who lived with him in his hermitage - Agapi, Chonia and Irene - were to be martyred by the emperor in nine days, and that Saint Anastasia would come and prepare them. While Saint Anastasia was instructing them, the blessed Zoilos departed unto the Lord in peace. The Great Martyr Anastasia took the sisters to another place and urged them to endure all things for Christ. Soon what was predicted in the vision came to pass. 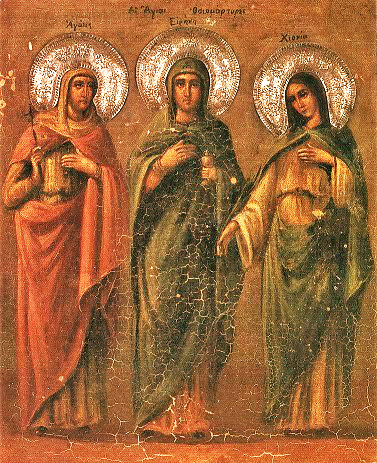 The three virgins were arrested and brought to trial before the emperor Diocletian (284-305). When they reported back to Sisinius, he flew into a rage, since he had given no such orders. The luminous soldiers were angels of God, saving the holy martyr from defilement. Sisinius went to the mountain with a detachment of soldiers and saw Saint Irene on the summit. For a long while they searched for the way to the top, but they could not find it. Then one of the soldiers wounded Saint Irene with an arrow. The martyr cried out to Sisinius, “I mock your impotent malice, and I go my Lord Jesus Christ pure and undefiled.” Having given thanks to the Lord, she lay down upon the ground and surrendered her soul to God. Sisters in the flesh and united in the Spirit, you wrestled with the prince of evil and endured your martyrdom. 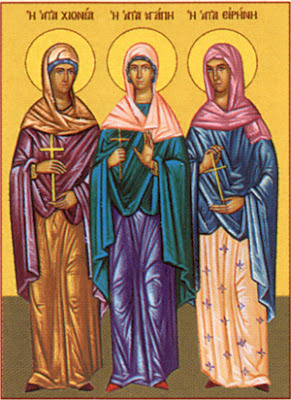 Holy and blessed Agape, Irene and Chionia, pray to Christ our God to save our souls. Bright mirrors of virginity, radiant with your martyrdom, you fill the Church with light and dispel the darkness of evil, Agape, Irene and Chionia, Christ's precious jewels.